Analytics Edge makes it easy to get data from Google Analytics into Excel, and here are a few tips to make it easier to build impressive reports. Any of the percent, rate or average metrics downloaded from Google Analytics will be automatically delivered as portions of 1 (so 50% will appear as 0.5). 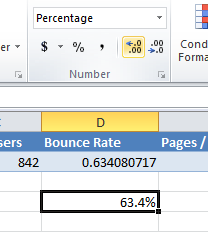 This allows you to use Excel’s Percentage cell formatting. Also, do not get carried away with too many numbers after the decimal; one is usually enough (63.4%), two if the numbers are under 10% (6.34%). Web analytics is not an exact science. Time metrics like Session Duration in Google Analytics is reported in seconds. To display it in the more familiar time format, you need to first convert the seconds to a fraction of a day; =cell/60/60/24 (60 seconds/minute, 60 minutes/hour, 24 hours/day). 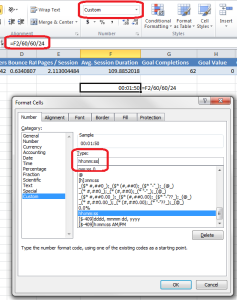 Then you can use the Excel custom date format option and enter hh:mm:ss to get the display desired. 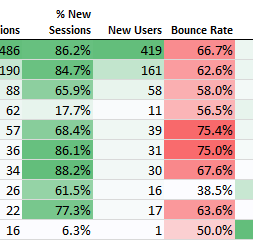 If you are using conditional formatting to highlight metric trends, remember that some metrics like Bounce Rate may be considered worse, not better, if they are larger. If you do use conditional formatting, consider making them red, or use a custom scale that shifts from green to yellow to red at specific thresholds consistent with your website goals. This entry was posted in Google Analytics on 2014/06/17 by articles.
! Keep it Free and Unrestricted !